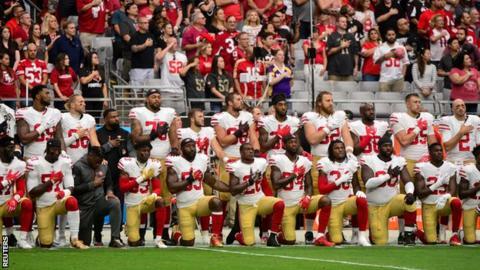 San Francisco said their protest was a "representation of how we hope the country can come together"
NFL players continued their anthem protests in defiance of US President Donald Trump in Sunday's matches. About half of the San Francisco 49ers knelt for the anthem before their match at Arizona with their team-mates standing just behind with a hand on their colleagues' shoulders. The Carolina Panthers' Cam Newton celebrated his touchdown against New England Patriots with a raised fist. However, there were markedly fewer protests than last weekend. Several games - such as the Dallas Cowboys' home game with the Los Angeles Rams - appeared to go ahead without any protest. In the day's first game at Wembley, three Miami Dolphins - Julius Thomas, Michael Thomas and Kenny Stills - kneeled during the American anthem with the opposing New Orleans Saints squad opting to do so beforehand, but then standing while the anthem was played. President Trump tweeted on Saturday, reiterating his disapproval of the protests. He has previously called for NFL owners to dismiss players who take part. A handful of Buffalo Bills and Detroit Lions players kneeled as the anthem played before their games against the Atlanta Falcons and Minnesota Vikings respectively. The Baltimore Ravens were jeered by some of their own fans after taking to one knee for "a moment of unity" before the anthem in their match against the Pittsburgh Steelers. The protests began last year with Colin Kaepernick - then of the 49ers - highlighting the treatment of black Americans after a series of high-profile police shootings. And Kaepernick's former team - playing for the first time since Trump's initial condemnation of the protest - made the most co-ordinated gesture. "For more than a year, members of our team have protested the oppression and social injustices still present in our society," read a statement from the 49ers' players, coaches, ownership and staff. "While some may not have taken a knee or raised a fist, we have all shared the desire to influence positive change. Today, our team chose to publicly display our unity in a new way." The statement added: "We use our platform as members of an NFL team, and our right to freedom of expression, to speak up for those whose voice is not heard." Quarterback Newton's gesture echoed that made by American Olympic medallists Tommie Smith and John Carlos on the podium at Mexico 1968 in protest at the marginalisation of black Americans. The 28-year-old said last week that Trump's comments had been "unacceptable" before reaffirming his right to an opinion. Once the action got under way in London, the Saints cruised to a comfortable 20-0 victory over the Miami Dolphins via touchdowns from Michael Thomas and Alvin Kamara. The match - watched by 84,423 fans - never really got going. After a first half littered with penalties, only a Wil Lutz field goal separated the teams. But the Saints stretched away in the second through Thomas' powerful run and Kamara's dart into the endzone from Drew Brees' shovel pass. The Arizona Cardinals play the Los Angeles Rams on 22 October and the Minnesota Vikings play the Cleveland Browns in the final two matches to be hosted in London. Both will be staged at Twickenham, the home of English rugby union.